Scattering phenomena can be very complicated - even for a monochromatic light source - since the scattering is dependent on the size of the scattering sphere. In his seminal paper "Mie theory, Airy theory, and the natural rainbow" 1, Raymond L. Lee used a powerful technique to illustrate how the appearance of rainbows varies with the size of the scattering water drops. The MiePlot program can produce such "Lee diagrams", in which each coloured point represents the colour of light scattered in a specific direction by a drop of radius r - as shown in Figs. 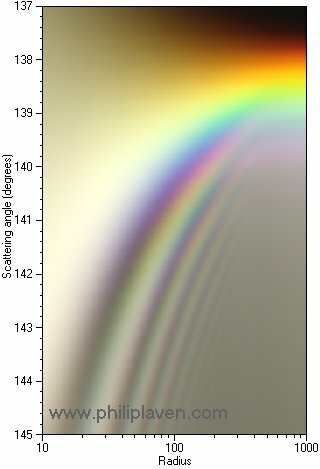 1 and 2 (where scattering at angles between 137° and 145° has been calculated for 300 values of r between 10 µm and 1000 µm, using the "High" option for the number of wavelengths). Note that this diagram required about 30 hours of computation time! For each value of r, the primary rainbow is depicted by a vertical column of colours. 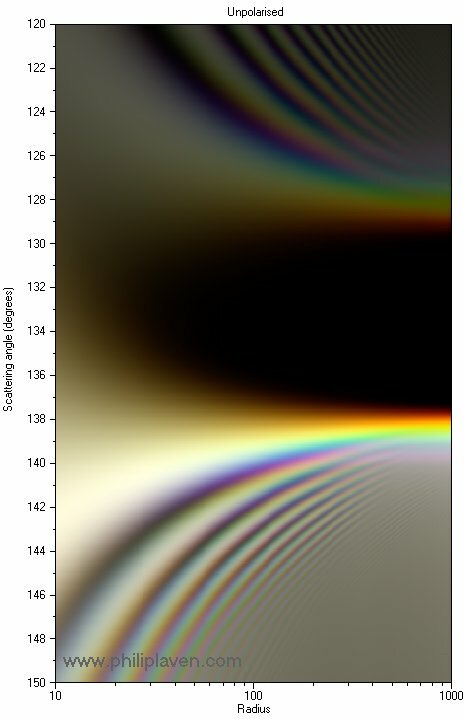 The brightness of each vertical line of colours has been normalized by the maximum luminance for that value of r.
Fig. 1 shows brightly coloured primary rainbows caused by scattering of sunlight for r between 300 µm and 1000 µm. For drops with r between 500 and 1000 µm, the brightest scattering occurs between 138° and 139°, whereas the maximum scattering for r = 10 µm drops occurs around 142°. Very small droplets of water (r < 30 µm), such as occurring those in fog or clouds, produce a rainbow that is almost white - known as fogbows or cloudbows for obvious reasons. Supernumerary arcs are not visible for r > 300 µm, but become more obvious and more widely spaced for r < 200 µm. Comparison of Figs. 1 and 2 shows that the supernumerary arcs are less visible when the water drops are not uniform in size. For r around 100 µm, 4 supernumerary arcs between 141° and 145° are clearly visible for uniform drops (in Fig. 1), but they are less visible for drops with a log-normal size distribution with a standard deviation of 10% (in Fig. 2). Fig. 3 shows how the appearance of primary and secondary rainbows varies with the radius r of the water drop. Alexander's dark band is clearly visible between the primary and secondary rainbows.